I love how food can transport us around the world in one dish and we are privileged in this country to have access to so many different cuisines. Some people lament the lack of decent British cooking (which is something else that is not true, but a discussion for another time) but why worry when one night I can eat in India, the next in Mexico, the next in France, then Italy, China or Thailand. So partially my cooking is a way of satisfying my wanderlust without crossing continents and bankrupting us. I travel in my kitchen each time I cook. 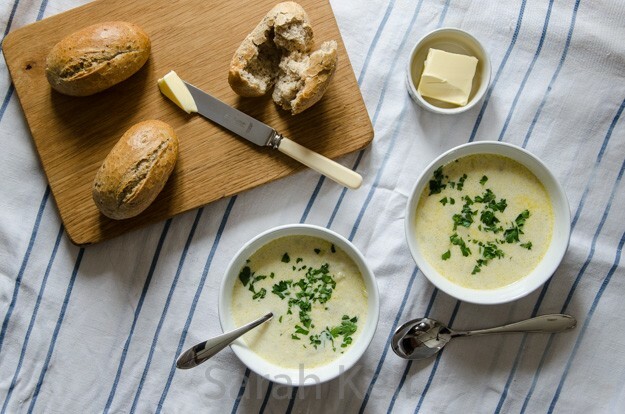 Cullen skink (no, it is not a typo) is a traditional Scottish soup. It is hearty enough to be an entire meal, served with some crusty bread. The last time I had it when it was not homemade was in Seattle where it is called a ‘Chowder’ and sprinkled with dry water crackers like you would have with cheese. The American version also contains sweetcorn but is otherwise the same dish. You must use good quality smoked haddock that is naturally smoked, not the bright yellow stuff. Melt the butter in a heavy bottomed large saucepan. Add the onions and a pinch of salt; sweat until the onions are translucent. Add the milk, 300ml water and the bay leaf and mace. Add the potatoes, bring to the boil and simmer for 15 minutes until the potatoes are soft. Meanwhile cook the smoked haddock. I usually poach it in a water/milk mixture and then add the liquid to the soup for more flavour. Allow the haddock to cool enough to touch and then remove skin and bones and break into large flakes. Remove the bay leaf and mace from the soup, use a potato masher to gently crush the potatoes so that some thicken the soup but some are still in chunks. Add the cream and sweetcorn if using and the fish. Heat again to the boil and taste, adjusting the seasoning as desired. Serve immediately or allow to cool and store in the fridge for up to 48 hours. Whenever I make this soup, the colourful bowlful and cheery flavours brightens up the dampest of wet winter days. Saying that though, I can tell spring is close now; the dawn chorus has returned, it is just about light when I get up, the sun has some warmth in it when it is out from behind a cloud and little shoots are appearing in the garden and on our walks. I suppose we should be grateful for living on the top of a hill and not in a flood, but the incessant mud and grey skies are very soul draining. 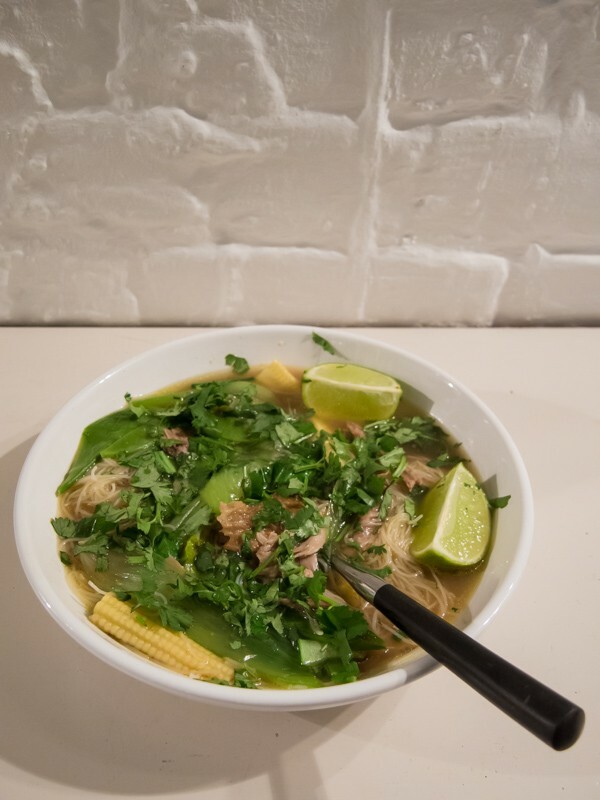 I have never eaten a soup of this style in Asia and I am not sure it could ever be called an ‘authentic’ Asian recipe, whatever that may mean, but the flavours of that part of the world are in this soup and the cheerful colour reminds me of the sunnier latitudes. I hope it cheers up your winter days too. This recipe is adapted from Hugh Fearnley-Whittingstall’s ‘River Cottage Everyday’. I think cutting up raw squash is asking for an injury; sharp knife and a round, moving and very hard object do not make a good combination. In this recipe I get round that problem by roasting the squash whole first so it is meltingly tender and easy to prepare. I usually do this when the oven is on for something else, for example our evening meal, to save energy. Place the butternut squash on a baking tray, stab a few times with a sharp knife and place in a medium to hot oven for 30 minutes to maximum 45 minutes until it is soft all the way through when you insert a sharp knife. 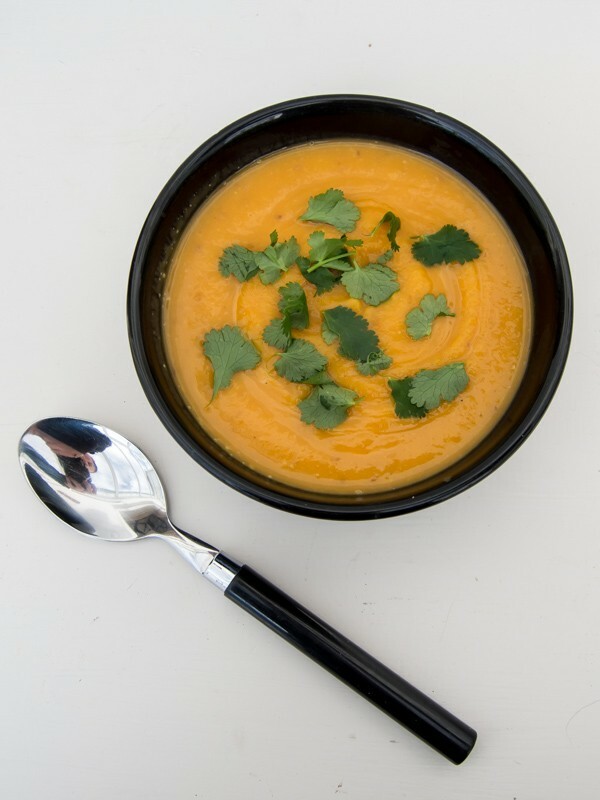 Allow the butternut squash to cool sufficiently to handle; this takes about an hour at room temperature. Scrape the flesh of the squash into a bowl using a large spoon or your clean hands, discarding the skin (unless you want to add that for extra fibre) and seeds with the fibres (unless you want to wash the fibres off the seeds and roast them for the topping – too much hassle for me). Heat the oil in a large saucepan and then add the onion and a pinch of salt (the salt stops the onion catching); cook until the onion is soft, sweet and translucent. Add the chili, ginger and garlic and stir for a minute or two until fragrant. Add the reserved butternut squash and enough stock to cover the squash. Cover, bring to the boil and simmer for about 15 minutes to meld the flavours. Add the peanut butter and lime juice, stir until the peanut butter has melted. 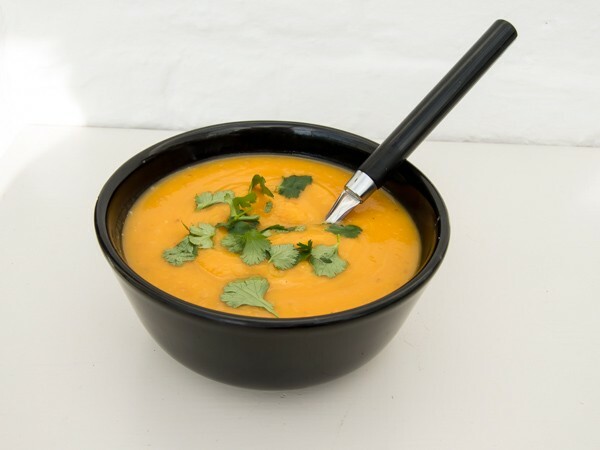 Blend the soup with a hand blender or in a blender. Taste the soup and adjust the seasoning as required. Serve! I love food travelling; in other words, making a dish or meal that transports you to somewhere else. That is what this soup does for me. 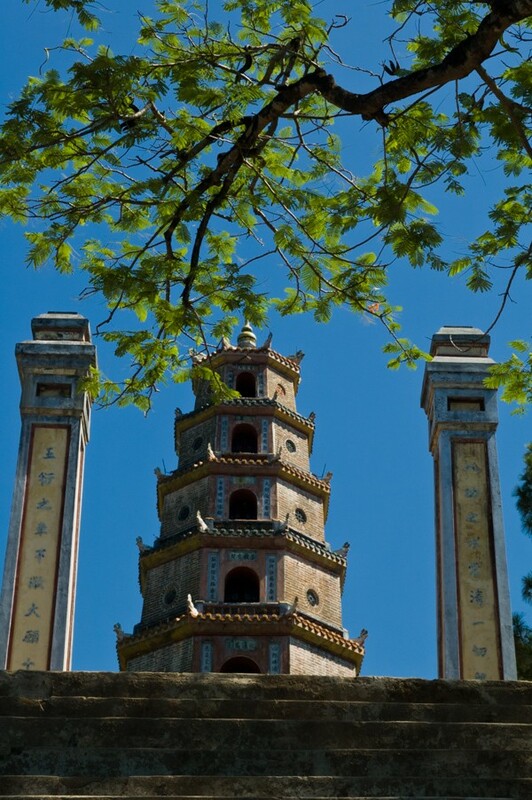 One sniff and one taste, I am back to Hanoi in Vietnam. 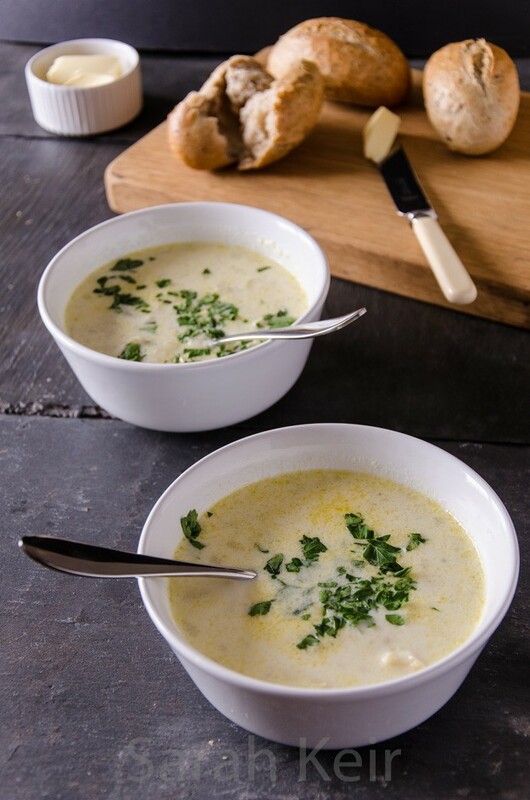 Making these travel inspired dishes is also a whole lot cheaper than going there, even if it only lasts for the duration of the soup supping! Please feel free to alter the vegetables to whatever you have or what ever is on offer at the time. The garnishes are also personal preference too. 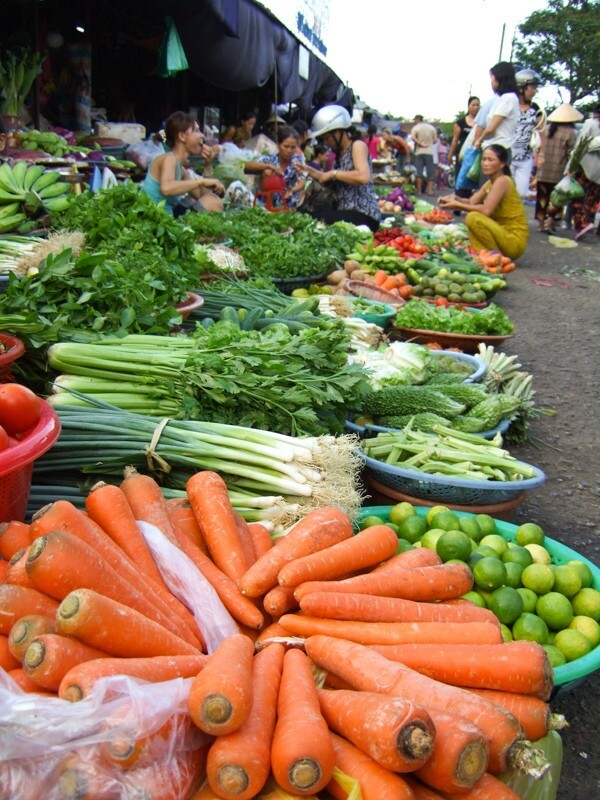 In Vietnam, they arrive on a dish separate from the soup and it is up to the diner to add which and what and how much to give a personalised soup. To make the pho broth, in a large pan that will hold the duck carcass fully submerged and has a tight fitting lid, put the duck carcass, the whole spices, ginger, chili, fish sauce and onion (and fresh coriander stalks if you have any). Add enough fresh water until the carcass is just submerged. Bring to the boil then turn down to a simmer. Allow to simmer for at least an hour, and ideally 2-3 hours. Remove the duck carcass from the broth and leave to cool on a plate. When cooled enough to handle, pick off the meat (and skin – it is traditional) and reserve the meat and throw away the bones. Strain the broth through a sieve into a clean pan, taste and adjust salt levels if necessary. Bring back to a simmer and add the noodles, vegetables and reserved meat; simmer for a minute or two then ladle into bowls and serve with the accompaniments, which are essential not optional.